My 12-year-old Labrador just tore her cruciate ligament. Should I have her undergo surgery to repair it at her age? 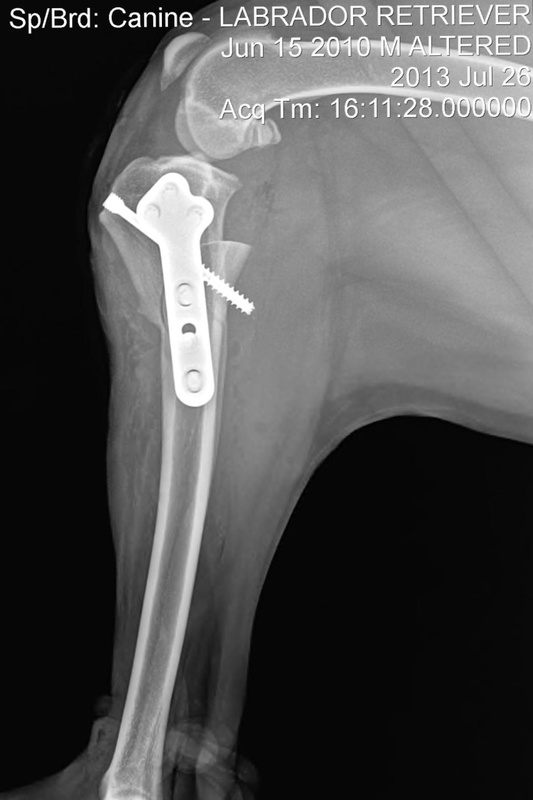 In a young dog with a completely torn cruciate ligament, it is an easy decision to have the knee surgically repaired. In a geriatric animal, this decision becomes more complex. It depends not only on the overall health of your dog. From a practical standpoint, when a patient is nearing her life expectancy, financial considerations come into play to a greater degree. Let me start by giving you some information on the anatomy of the canine knee. There are two cruciate ligaments in the knee. The anterior cruciate ligament (ACL) helps stabilize the knee joint and is the one that most commonly tears in the dog. There are different degrees of tear that can occur. Sometimes there is a partial tear in the ligament. In this situation, the dog experiences pain from the inflammation associated with the torn ligament, but the knee is often still stable. When a full ACL tear occurs, veterinarians can tell because the tibia (“shin” bone) can be displaced forward. This is called a drawer sign. Dogs with a complete ACL tear have a knee joint that is not stable. Every time they step on that leg, the tibia shifts forward. This type of injury requires surgery to stabilize the joint. A dog with a full ACL tear that is not surgically repaired will be lame on the injured leg for a long time, sometimes their whole life. Eventually scarring can occur around and inside the knee to help stabilize the joint, but it take years for that process to happen. I have seen dogs with completely torn ACL ligaments that the owners have elected not to have surgically repaired. The lifestyle of these dogs dramatically changes. They can’t go for long walks or runs anymore unless they are small enough or strong enough to pick up the injured leg when they run or tire out. Eventually, as scarring around the knee occurs, they will start to use the leg more, and it becomes more functional over time. In young, healthy animals with a completely torn ACL, the very best thing is to have the leg surgically repaired. The goal of surgery is to stabilize the knee so the dog can go back to doing all of the things they (and you) like to do: running, going for walks, wrestling with other dogs, going on trips to the dog park, etc. If your pet is otherwise very healthy, then you may be more inclined to pursue surgery. If your pet has other disease processes going on, like internal organ disease or autoimmune disease, that will impact the decision about whether or not to proceed with surgery. Your pet may be a higher risk anesthetic candidate, and the life expectancy of your pet may be shorter. Labradors have a life expectancy of about 12–15 years of age. At 12 years of age, your dog may only live less than a year, or she may live another 3 years. In a large-breed dog, the type of surgery that is typically done to repair a torn ACL is either a technique called a TTA or a TPLO. In both of these techniques, a portion of the tibia is cut and “realigned” to change the angle of the knee and stabilize the abnormal movement that occurs after a complete ACL tear. Dogs that undergo this technique are essentially recovering from a fracture repair. It takes two to three months to recover from this type of surgery, and in older dogs, it sometimes takes longer. This recovery time is a consideration in a geriatric animal. Depending on where the surgery is performed, a TTA or TPLO surgery is $3,500–$5,000. From a practical standpoint, it can sometimes be hard to justify that expense if you think your animal will only live another year or two. If you don’t proceed with surgery, you would want to make sure that your pet was comfortable and would keep her on pain medications — likely for the rest of her life. Most arthritis medications prescribed for dogs are $50–$90 a month, depending on the type of medication that is chosen, and often a “cocktail” of medications and joint supplements are given if the patient isn’t experiencing enough pain relief with just one medication. If you end up spending $100 a month on pain medication, you a third of the way to the cost of the surgery after a year of medication. If you don’t repair the knee, the injured leg is not very functional for a long period of time. That means that your dog will shift weight to the other limbs and the neck and back for support when walking. It is important to know that this puts a stress on the rest of the body. I think it is helpful to look at the two extremes when it comes to the outcome after an ACL injury. From a financial standpoint, one extreme is that you repair the knee and your pet dies from an unrelated illness six months later. In a geriatric animal, this is a possibility. If you lost your dog six months after surgery, would you be upset that you spent $4,000 on surgery? Is this something that would put extreme pressure on your family financial situation? The other extreme is that you could elect to not repair the knee and your pet ends up living another three years and will need to deal with an unstable, uncomfortable knee during that time. Will you be kicking yourself because you didn’t do the surgery? Every patient and family situation is unique. There is not one right answer for the best way to proceed in this situation. Your veterinarian is a good resource for you and can support you in whichever path you choose. As with most avaricious “vets,” I see you are pushing the very >>> lucrative <<< and problematic CrCL surgery only. If you were a REAL "doctor" you would have mentioned custom dog knee braces, which have been around for over 15 years. (some companies show their stife braces at the ACVS seminars – ever been to one of those??) Why did you not mention bracing, as a valid treatment protocol? Why did you not mention the 35% + serious complication rate with TPLO [osteosarcoma / implant recalls], TTA, LSS, Excap, etc etc or the 75,000 ++ beloved dogs who died from renal failure, liver failure or GI hemorraging after a "vet prescribed the toxic BIG PHARMA NSAIDS." Honestly, we will never seek you out for our 3 dogs, ever. My almost 9 year old dog had TPlO surcery Feb22. 3 weeks after the surgery he had blood in his stools. I brought him in and the vet wanted to xray him. I let him, but what I didn’t know was that they would be putting him on his back. This is a 100lb dog 3 weeks in from TPLO and a partial knee removal…The vets first words to me we’re, “Boy did we ever have a struggle with him getting him on his back..He was brought back to me with a small abrasion on his back but otherwise looked okay. When I got him home and tried to do his physio an hour or so later, he would not let me. When I did manage to do a couple of bends, I could hear cracking so I stopped immediately. He is now 4 months in and walks funny with that leg. When he walks it swoops inwards and then out. He still stands with it out not totally wright bearing. Today I tossed a stick in the water for him making sure he did not pounce in after it. I did this twice and maybe 20 feet out tops. He now can barely walk on the leg…I can tell you my hurt has been saying all aling tgat something bad happened to the leg the day if the xray. The vet told me he was walking fine on the leg so not to worry about physio ..this was only 3 weeks in…Anyhow do you have any ideas what might have happened . I feel like the vet took years off if his life. And from what I see he isn’t improving and I have the okay for him to continue regular exercise now…That was put in writing, he last saw the specialist in May…Is there anyway that I can get a scan of his knee and what is going on?